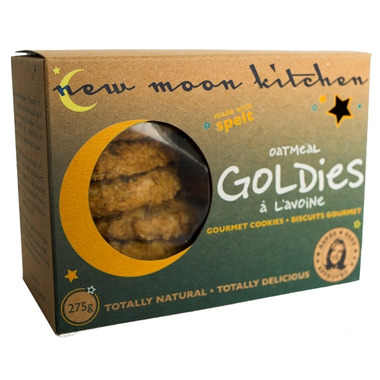 New Moon Kitchen Oatmeal Goldie Cookies are the perfect wholesome and yummy oatmeal cookie- toasty oats with warm vanilla and that mistakable homemade taste. Known to be dipped in tea, coffee or any milk choice! 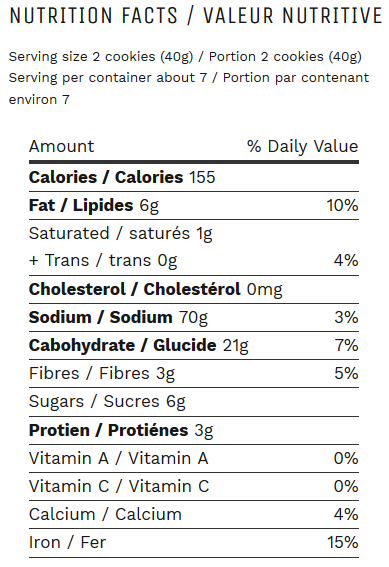 Ingredients: Oats, organic spelt flour, unrefined can sugar, organic evaporated can juice, pure sunflower oil, baking soda, sea salt and pure vanilla extract. These are pretty good for a natural cookie. A bit bland, but if you dip them in coffee or tea and you will not be disappointed. Light, and crunchy - will definitely try some of their other flavours.